So you want to give MobaSSH a try? Fine. 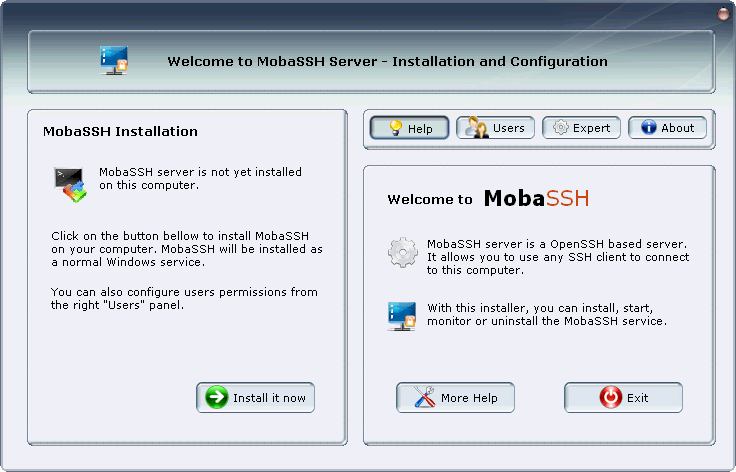 Let's begin by downloading the MobaSSH installer from here. Log on to the remote computer that you want to administer. Start the downloaded program and click on the "Install it now" button on the left panel. Wait until the service is installed and started. You're done! Your SSH server is ready and you can immediately log on to it through the network. We recommend you use the great SSH client "PuTTY" in order to test the SSH server: just start PuTTY on the same computer and try to connect to "localhost", with protocol "SSH" (port "22"). 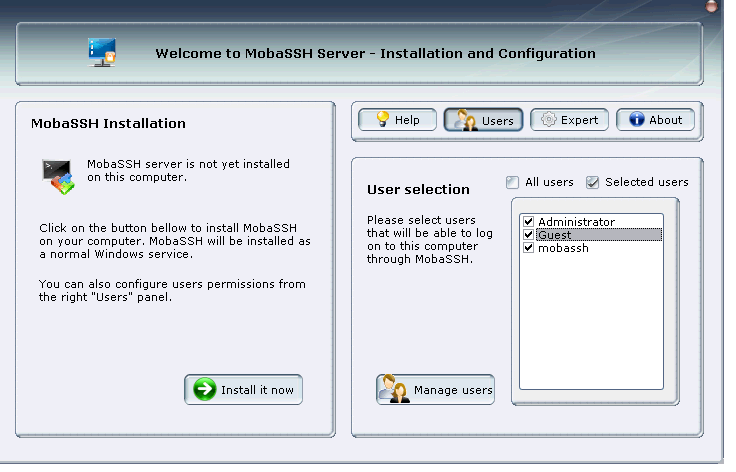 MobaSSH installer allows you to select which users will be able to log on to the computer through the SSH server. Note that MobaSSH server authentication is based on Windows authentication, so the login/password are the same as Windows ones. 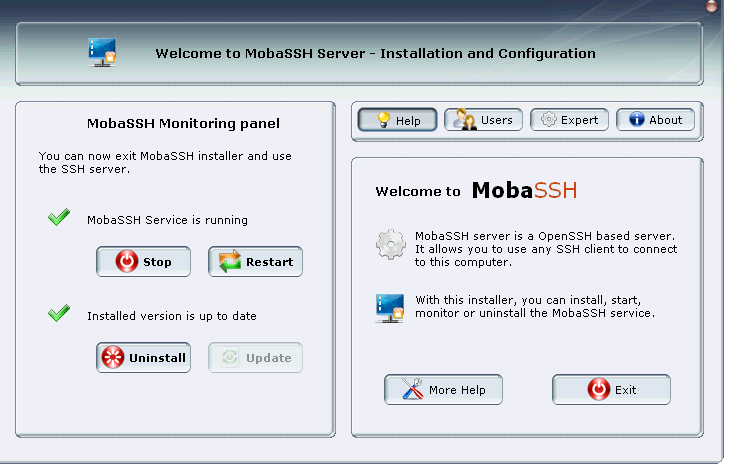 Once you're done installing MobaSSH, you can check if the SSH server is running and if it is up to date. 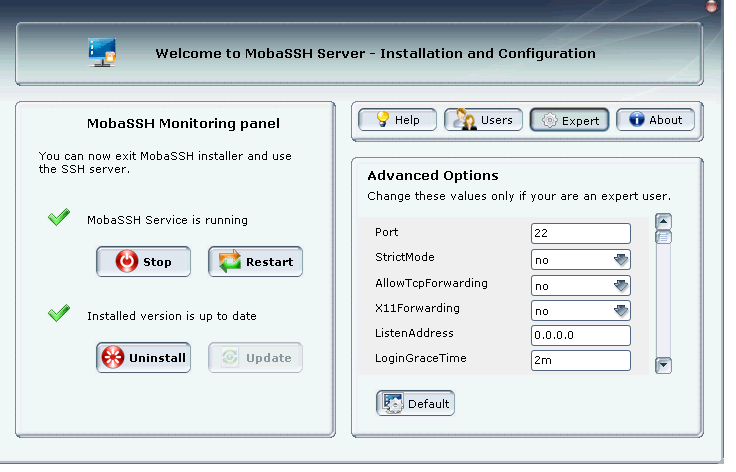 You can then start, stop or restart the MobaSSH service by clicking on the appropriate button on the left side of the installer. If you want, you can also enable/disable some users accounts, you will just have to restart the service for the changes to take effect, by clicking on the "Restart" button. MobaSSH runs as a normal Windows service, so you can of course monitor it through the Windows interface. Just go to the Configuration Panel, select "Administration Tools" and then start the "Services" interface. You will see a line beginning with "MobaSSH". Here you are, you can start/stop/restart/monitor the service from here. MobaSSH can also be started or stopped through the shell command prompt: just call "net start MobaSSH" to start the service or "net stop MobaSSH" to stop it. MobaSSH allows advanced users to modify options of the MobaSSH services. You can access these options on the Expert panel. Specifies whether TCP forwarding is permitted. The default is``yes''. Note that disabling TCP forwarding does not improve security unless users are also denied shell access, as they can always install their own forwarders. Specifies the file that contains the public keys that can be used for user authentication. AuthorizedKeysFile may contain tokens of the form %T which are substituted during connection set-up. The following tokens are defined: %% is replaced by a literal '%', %h is replaced by the home directory of the user being authenticated and %u is replaced by the username of that user. After expansion, AuthorizedKeysFile is taken to be an absolute path or one relative to the user's home directory. The default is ``.ssh/authorized_keys''. Specifies whether challenge response authentication is allowed.The default is ``yes''. which the forwarding is bound. The default is ``no''. local addresses. Multiple ListenAddress options are permitted. cessfully logged in. If the value is 0, there is no time limit. value, additional failures are logged. The default is 6. 22. Multiple options of this type are permitted. default is ``yes''. This option applies to protocol version 1 only. leave their directory or files world-writable. The default is ``yes''. be ``yes'' or ``no''. The default is ``no''. X11 forwarding, which can warrant a ``no'' setting. Transferring files to/from the SSH server is as easy as transferring files using the FTP protocol, but the connection is encrypted, so no one can see the data you transfer. For Windows users: we recommend you to use the great graphical client called "WinSCP". Just run it, enter your connection parameters and you will see a great interface with your local directories on the left side and the remote directories on the right side. Just drag and drop your files from one side to the other to transfer your files. For Linux users, you can use the graphical interface provided by Konqueror, Nautilus or a lot of other file managers. For Windows users, you can use the great command-line tool provided with PuTTY called "psftp", or the cygwin scp utility. For Linux/Unix/HP-Ux/AIX users, you can use the OpenSSH clients called scp or sftp. You will have to generate a public rsa key on the client. This can be done in many ways depending on the client program you are using. PuTTY comes from a utility called "PuTTYgen" for doing it. With OpenSSH, just run the "ssh-user-config" script. It will create the public RSA key (usually stored in the ~/.ssh/id_rsa.pub or /etc/ssh/id_rsa.pub). Copy the file that has been generated on the client ("id_rsa.pub") to the C:\Documents and Settings\<your_user>\.ssh\ directory and rename it to "authorized_keys". You're done, you can now log in the SSH server with the defined client without typing any password. In the following examples, the server is called "Server1" and the client is called "Supervisor1". ssh Administrator@Server1 "cd /tmp; msiexec /i MyApplication.msi /qn"
Here you are, the program was installed on the computer without any user interaction ! ssh Administrator@Server1 "cd /tmp; ./Setup.exe /VERYSILENT /SP-"
A lot of installers can be run silently ("unattended" mode) by using the "/s" switch at command-line. In most case, these command-line switches can be found at program documentation.